"Razin" redirects here. For places in Iran, see Razin, Iran (disambiguation). Stepan Timofeyevich Razin (Russian: Степа́н Тимофе́евич Ра́зин, Russian pronunciation: [sʲtʲɪˈpan (ˈsʲtʲenʲkə) tʲɪmɐˈfʲeɪvʲɪtɕ ˈrazʲɪn]; 1630 – June 16 [O.S. June 6] 1671), known as Stenka Razin (Стенька), was a Cossack leader who led a major uprising against the nobility and tsarist bureaucracy in southern Russia in 1670-1671. Razin's parents were from the village of Usman Sobakina, 8 kilometres (5.0 mi) outside of Voronezh. He was first noted by history in 1661, as part of a diplomatic mission from the Don Cossacks to the Kalmyks. That same year Razin went on a long-distance pilgrimage to the great Solovetsky Monastery on the White Sea for the benefit of his soul. After that, all trace of him was lost for six years, when he reappeared as the leader of a robber community established at Panshinskoye, among the marshes between the rivers Tishina and Ilovlya, from whence he levied tribute from all vessels passing up and down the Volga. A long wars with Poland in 1654-1667 and Sweden in 1656-1658 put heavy burden upon the people of Russia. Taxes increased, as did conscription. Many peasants, hoping to escape these burdens, fled south and joined bands of Razin's marauding Cossacks. They were also joined by many others who were disaffected with the Russian government, including people of the lower classes, as well as representatives of non-Russian ethnic groups such as Kalmyks, that were being oppressed at the time. Razin's first considerable exploit was to destroy the great naval convoy consisting of the treasury barges and the barges of the Patriarch and the wealthy merchants of Moscow. Razin then sailed down the Volga with a fleet of 35 vessels, capturing the more important forts on his way and devastating the country. At the beginning of 1668, he defeated the voivode Yakov Bezobrazov, sent against him from Astrakhan, and in the spring embarked on a predatory expedition into Daghestan and Persia, which lasted for eighteen months. Russia began the 17th century with the Time of Troubles, which lasted from 1598 to 1613. This time marked the end of the Rurik dynasty and the beginning of the Romanov dynasty (which would eventually end with the October Revolution and the execution of the last tsar, Nicholas II, and the tsarevich, Alexei Nikolaevich in 1918). Michael Romanov (tsar from 1613 to 1645) and his son Alexis (tsar from 1645 to 1676) both strove to strengthen the power of the tsar in order to stabilize the country after the turmoil of the Time of Troubles. As a result, the Zemsky Sobor and the boyar council, two other bodies of government in Russia, slowly lost influence. The Russian population went from fifteen years of "near anarchy" to the reigns of two strong, centralizing autocrats. In addition, a deep divide existed between the peasantry and the nobility in Russia. Recent changes in the treatment and legal standing of peasants, including the institutionalization of serfdom in the Law Code of 1649, contributed to the unrest among the peasantry. The Don Cossacks, a lower-class group that lived independently near the Don River and whom the tsar's government supplied in exchange for defending Russia, led Razin's rebellion. Historian Paul Avrich characterizes Razin's revolt as a "curious mixture of brigandage and revolt," similar to other popular uprisings of the period. Razin revolted against the "traitor-boyars" rather than the tsar. The Cossacks supported the tsar because they worked for him. In 1667, Razin gathered a small group of Cossacks and left the Don for an expedition in the Caspian Sea. He aimed to set up a base in Yaitsk (now known as Oral, located in Kazakhstan on the Ural River) and plunder villages from there. However, Moscow learned of Razin's plans and attempted to stop him. 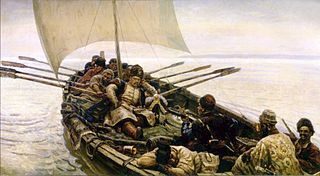 As Razin traveled down the Volga River to Tsaritsyn, the voivodes of Astrakhan warned Andrei Unkovsky (the voivode or governor of Tsaritsyn) of Razin's arrival and recommended that he not allow the Cossacks to enter the town. Unkovsky attempted to negotiate with Razin, but Razin threatened to set fire to Tsaritsyn if Unkovsky interfered. When he encountered a group of political prisoners being transported by the tsar's representatives on his way from the Don to the Volga, Razin reportedly said, "I shall not force you to join me, but whoever chooses to come with me will be a free Cossack. I have come to fight only the boyars and the wealthy lords. As for the poor and plain folk, I shall treat them as brothers." When Razin sailed by Tsartisyn, Unkovsky did not attack (possibly either because he felt that Razin posed a threat or because the guards of Tsaritsyn sympathized with Razin's Cossacks). This incident gave Razin the reputation of an "invincible warrior endowed with supernatural powers." He continued his travels down the Volga and into the Caspian Sea, defeating several detachments of streltsy, or armed guardsmen. 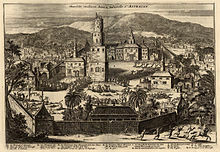 In July 1667, Razin captured Yaitsk by disguising himself and some of his companions as pilgrims to pray at the cathedral. Once inside Yaitsk, they opened the gates for the rest of the troops to enter and occupy the city. The opposition sent to fight Razin felt reluctant to do so because they sympathized with the Cossacks. In the spring of 1668, Razin led the majority of his men down the Yaik River (also known as the Ural River) while a small portion stayed behind to guard Yaitsk. However, the government defeated Razin's men in Yaitsk and Razin lost his base there. Stepan Razin Sailing in the Caspian Sea by Vasily Surikov, 1906. After losing Yaitsk, Razin sailed south down the coast of the Caspian Sea to continue his pillaging. He and his men then attacked Persia. Failing to capture the well-defended fortress port of Darband/Derbent in present-day Dagestan, his forces moved south to attack the small port of Badkuba (present Baku) located on the Absheron Peninsula in present-day Republic of Azerbaijan, but at Rasht (in the southwest Caspian Sea in modern Iran) the Persians killed roughly 400 Cossacks in a surprise attack. Razin went to Isfahan to ask the shah for land in Persia in exchange for loyalty to the shah, but departed on the Caspian for more pillaging before they could reach an agreement. Razin arrived in Farahabad (on the southern shore of the Caspian Sea in Iran) and masqueraded as a merchant in the city for several days before he and his men pillaged the city for two days. That winter the Cossacks with Razin fended off starvation and disease on the Miankaleh Peninsula, and in the spring of 1669 Razin built a base on the eastern side of the Caspian Sea and began raiding Turkmen villages. Then in the spring of 1669 he established himself on the isle of Suina, off which, in July, he annihilated a Persian fleet sent against him. Stenka Razin, as he was generally called, had now become a potentate with whom princes did not disdain to treat. In August 1669 he reappeared at Astrakhan and accepted a fresh offer of pardon from Tsar Alexei Mikhailovich there; the common people were fascinated by his adventures. The lawless Russian border region of Astrakhan, where the whole atmosphere was predatory and many people were still nomadic, was the natural milieu for such a rebellion as Razin's. In 1670 Razin, while ostensibly on his way to report at the Cossack headquarters on the Don, openly rebelled against the government, capturing Cherkassk and Tsaritsyn. After capturing Tsaritsyn, Razin sailed up the Volga with his army of almost 7000 men. The men traveled toward Cherny Yar, a government stronghold between Tsaritsyn and Astrakhan. 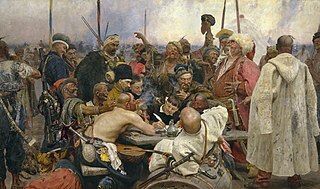 Razin and his men swiftly took Cherny Yar when the Cherny Yar streltsy rose up against their officers and joined the Cossack cause in June 1670. On June 24 he reached the city of Astrakhan. Astrakhan, Moscow's wealthy "window on the East," occupied a strategically important location at the mouth of the Volga River on the shore of the Caspian Sea. Razin plundered the city despite its location on a strongly fortified island and the stone walls and brass cannons that surrounded the central citadel. The local streltsy's rebellion allowed Razin to gain access to the city. After massacring all who opposed him (including two Princes Prozorovsky) and giving the rich bazaars of the city over to pillage, he converted Astrakhan into a Cossack republic, dividing the population into thousands, hundreds and tens, with their proper officers, all of whom were appointed by a veche or general assembly, whose first act was to proclaim Razin their gosudar (sovereign). After a three-week carnival of blood and debauchery, Razin quit Astrakhan with two hundred barges full of troops. His aim was to establish the Cossack republic along the whole length of the Volga as a preliminary step towards advancing against Moscow. Saratov and Samara were captured, but Simbirsk defied all efforts, and after two bloody encounters close at hand on the banks of the Sviyaga River (October 1 and 4), Razin was ultimately routed by the army of Yuri Baryatinsky and fled down the Volga, leaving the bulk of his followers to be extirpated by the victors. But the rebellion was by no means over. The emissaries of Razin, armed with inflammatory proclamations, had stirred up the inhabitants of the modern governments of Nizhny Novgorod, Tambov and Penza, and penetrated even as far as Moscow and Novgorod. It was not difficult to stir the oppressed population to revolt by promising deliverance from their yoke. Razin proclaimed that his object was to root out the boyars and all officials, to level all ranks and dignities, and establish Cossackdom, with its corollary of absolute equality, throughout Muscovy. Even at the beginning of 1671 the outcome of the struggle was doubtful. Eight battles had been fought before the insurrection showed signs of weakening, and it continued for six months after Razin had received his quietus. At Simbirsk his prestige had been shattered. Even his own settlements at Saratov and Samara refused to open their gates to him, and the Don Cossacks, hearing that the patriarch of Moscow had anathematized Razin, also declared against him. The tsar sent troops to suppress the revolt. As Paul Avrich notes in Russian Rebels, 1600–1800, "The brutality of the repressions by far exceeded the atrocities committed by the insurgents." The tsar's troops mutilated the rebels' bodies and displayed them in public to serve as a warning to potential dissenters. In 1671 Stepan and his brother Frol Razin were captured at Kagalnik fortress (Кагальницкий городок) by a Cossack starshina. They were given over to Tsarist officials in Moscow, and on 6 June 1671, following the announcement of the verdict against him, Stepan Razin was quartered on the scaffold on Bolotnaya Square. A sentence of death was read aloud: Razin listened to this calmly, then turned to the church, bowed in three directions, passing the Kremlin and the tsar and said: "Forgive me". The executioner then proceeded to first cut off his right hand to his elbow, then his left foot to the knee. His brother Frol, witnessing Stepan's torment, shouted out: "I know the word and the matter of the sovereign!" (that is, "I am willing to inform upon those disloyal to the tsar"). Stepan shouted back, "Shut up, dog!" These were his last words; after them the executioner hurriedly cut off his head. Razin's hands, legs and head, according to the testimony of the Englishman Thomas Hebdon, were stuck on 5 specially-placed stakes. The confession helped Frol to postpone his own execution, although five years later, in 1676, he was executed by beheading at the same place in Bolotnaya Square. Razin originally set out to loot villages, but as he became a symbol of peasant unrest, his movement turned political. Razin wanted to protect the independence of the Cossacks and to protest an increasingly centralized government. The Cossacks supported the tsar and autocracy, but they wanted a tsar that responded to the needs of the people and not just those of the upper class. By destroying and pillaging villages, Razin intended to take power from the government officials and give more autonomy to the peasants. However, Razin's movement failed and the rebellion led to increased government control. The Cossacks lost some of their autonomy, and the tsar bonded more closely with the upper class because both feared more rebellion. On the other hand, as Avrich asserts, "[Razin's revolt] awakened, however dimly, the social consciousness of the poor, gave them a new sense of power, and made the upper class tremble for their lives and possessions." At the time of the Russian Civil War, the famous writer and White emigre Ivan Bunin compared Razin to Bolshevik leaders, writing "Good God! What striking similarity there is between the time of Sten'ka and the pillaging that is going on today in the name of the 'Third International.'" Razin is the subject of a symphonic poem by Alexander Glazunov, Symphony no. 8 by Myaskovsky (op. 26, 1925), a cantata by Shostakovich, op. 119; The Execution of Stepan Razin (1964), a poem by Yevgeny Yevtushenko, and a novel, I Have Come To Give You Freedom [ru], (Я пришёл дать вам волю) by Vasily Shukshin. Stenka Razin is the hero of a popular Russian folk song, Ponizovaya Volnitsa, better known by the words Volga, Volga mat' rodnaya, Iz za ostrova na strezhen, and, simply, Stenka Razin. The words were written by Dmitri Sadovnikov (Дмитрий Николаевич Садовников) in 1883; the music is folk. The song gave the title to the famous Soviet musical comedy Volga-Volga. The melody was used by Tom Springfield in the song "The Carnival Is Over" that placed The Seekers at #1 in 1965 in Australia and the UK. A version of this song is also performed by Doukhobors in Canada. With his princess by his side. To his piercing jet-black eyes. Head and heart and life and hand!" From the Cossacks of the Don! Make this lovely girl a grave!" "Čto ž vy, bratcy, priunyli? Ej, ty, Fil'ka, čjŏrt, pljąši! "Dance, you fools, and let's be merry. To the place where beauty lies!" One of his atamans, Alena Arzamasskaia, was a former nun. Razin is the subject of the Landmark book "Chief of the Cossacks". ^ Avrich 1976, p. 51. ^ a b Avrich 1976, p. 52. ^ Avrich 1976, p. 53. ^ Perrie 2006, p. 610. ^ a b c Avrich 1976, p. 70. ^ Perrie 2006, p. 612. ^ Avrich 1976, p. 69. ^ Soloviev & Smith 1976, p. 132. ^ a b Avrich 1976, p. 72. ^ Avrich 1976, p. 73. ^ Avrich 1976, p. 82. ^ Avrich 1976, p. 83. ^ Avrich 1976, p. 84. ^ Avrich 1976, p. 109. ^ Avrich 1976, p. 116. ^ Avrich 1976, p. 117. ^ Bunin 1998, p. 246. Chisholm, Hugh, ed. (1911). "Razin, Stephen Timofeevich" . Encyclopædia Britannica (11th ed.). Cambridge University Press. Wikimedia Commons has media related to Stepan Razin. The Solovetsky Monastery uprising was an uprising of Old Believer monks, known as the Raskol, of the northern Solovetsky Monastery against the policies of Tsar Aleksey I. The uprising involved the siege of the Solovetsky Monastery by the Tsar's forces over the years from 1668 to 1676. Oryol was a frigate that served in the Russian Navy. It was commissioned by Tsar Alexis I to protect Russian trading ships on the Caspian Sea and became the first Russian-built warship. The ship was built between 1667 and 1669 by the developing shipyard in Dedinovo on the Oka River. Although Oryol was captured and burned in 1670, it has achieved lasting importance as a symbol of the birth of Russian naval power. Svinoy, Sangi-Mugan Island or Muğan daşı, is an island in the Caspian Sea located south of Baku, Azerbaijan. Stenka Razin, Op. 13, is a symphonic poem composed by Alexander Glazunov in 1885. Dedicated to the memory of Alexander Borodin, it is one of the few compositions written by Glazunov on a nationalist subject and is composed in a style reminiscent of Borodin and Pyotr Ilyich Tchaikovsky. Astrakhan Kremlin is a fortress in Astrakhan, Russia. Located on river island, on the most high hill, washed by Volga, Kutum, Tsarev and narrow anabranch Cossack’s. Battle of Simbirsk in 1670 was a decisive battle of Stepan Razin's rebelion.